Take Colin McCrae and the Subaru Impreza? Or Jimmy Clark and the Lotus 25? 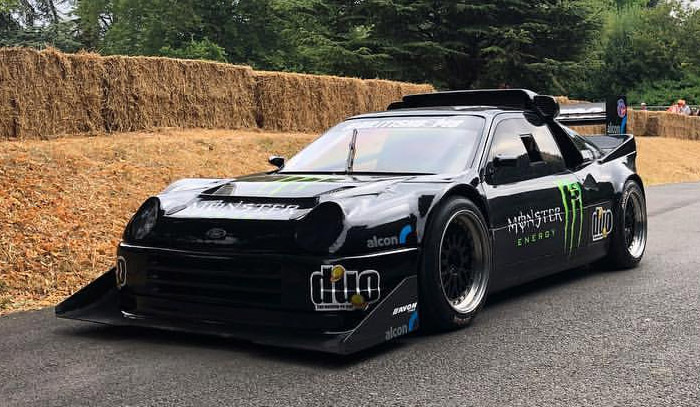 Another good example of this phenomenon is Pat and Liam Doran’s famous Pikes Peak RS200. 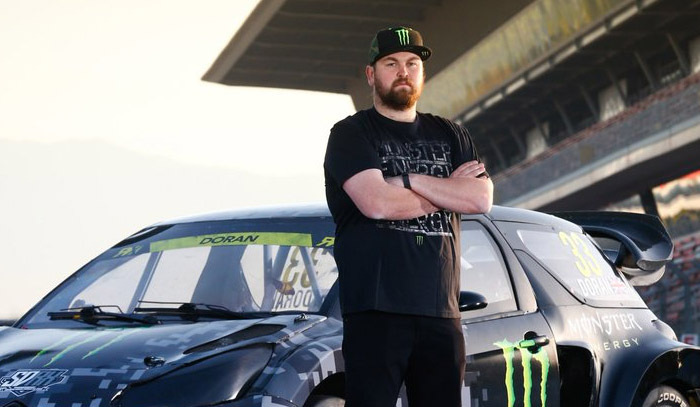 Liam, following in the footsteps of his famous Dad Pat who was four times winner of the British Rallycross Championship, has been making his name racing across the rough stuff competing in the X Games and the FIA Rallycross World Championship with the backing of Monster Energy since 2011. The RS200 was first built in 2012 by Pat for an assault on the world’s most fearsome hill climb course in Colorado. Those petrol heads with longer memories will remember the RS200 as the last of a breed of the fearsome Group B rally cars. Unfortunately for Ford, the car came to the party too late and therefore many were pensioned off, finding their way into the world of rallycross for which they were ideally suited. Their mid engined layout and an excess of horsepower made them potent weapons in the hands of Liam’s Dad Pat and it was his original 1983 car upon which this special was built. Now exactly how the idea of Pikes Peak came about is a little bit fuzzy, but when assessed, the realisation rapidly dawned that if they wanted to clinch the crown of the hill title they would need “a bigger boat”. And so the Pikes Peak Special was born. That excess of horsepower mentioned earlier was the first thing to receive attention. First the relatively puny 1.8 was bored out to 2.4 litres. Then a turbocharger, the likes of which Ford would never have originally entertained, was bolted on. The final result was a monstrous increase in power from the original 250 to an almost unbelievable 925bhp. An estimated top speed of around 160mph was anticipated with a sub 2 second 0-60 time placing it well into F1 territory. As it happens the Special has never really had the chance to reveal its full potential. Various mechanical woes and a fairly spectacular off by Pat took the edge off the two visits made to the Peak and its 156 corners. But even with those problems the team still managed sixth overall which was pretty impressive for new comers to the hill. Interestingly though it’s since returning from their various attempts in the U.S. that the car had gained a somewhat mystical and justifiably fearsome reputation. Indeed Pat has often said, that when he gets in the car it feels like it’s trying to kill him! Liam too has also had his share of run-ins with the beast and its tendency to shed various bits of bodywork at difficult moments, the most infamous so far being at this year’s Festival of Speed. Mind you his Dad didn’t fare much better the previous year when trying too hard in his less potent version of the RS200! However Liam’s RS200 wasn’t the only Pike’s Peak contender who had a difficult moment at the FOS this year. Volkswagen sent their own electric powered Pikes Peak challenger, the ID R: to Goodwood and it too had a very big moment on its trip up the hill. So whether the Doran’s car will ever be pointed up Pikes Peak again seems unlikely as the VW entrant, which took both the title for the fastest ascent in the U.S. and at Goodwood, seems to be the new shape of things to come. Yet whether it will prove to be the same crowd draw as the Doran’s black beauty seems unlikely, especially if you like your horsepower loud, proud and not to say a little intimidating.